Born Patricia Elaine Reasoner, “Peach” as she is known, may currently be a Venice, California resident, but friends, she has traveled the country making great music since she was 16. She knows how to play and how to move an audience. 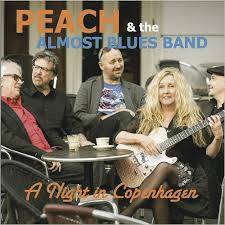 In February this year, she traveled to Copenhagen, Denmark, where she did a series of shows at the Cafe Bartof with her assembled group of musicians, The Almost Blues Band. The band consists of Peach Reasoner on lead guitars and vocals, Michael Engman Rønnow on guitars and vocals, Niclas Campagnol on drums, and Helge Solberg on bass and backing vocals. Also playing, over from the US of A is keyboard magician (and harp player as well), Ken Stange. Dylan’s “Tonight I’ll Be Stayin Here With You” is a revelation with its “Honky Cat” flavored piano lines, Peach’s cabaret vocal, and her guitar solo that is smooth as a Häagen-Dazs malt. Other standout performances here include “Never Make Your Move Too Soon,” featuring another tasty piano showing from Stange, with a fine back beat from Solberg and Campagnol, and guitar lines that lift the tune up nicely. “Love-itis” has a familiar 70s quality about it, especially Peach’s guitar lines, and “Tell Me You Love Me” is a fine, slow, organ flavored ballad, again with echoes of the 70s. “Come Up And See Me Sometime” swings with a lively guitar work, spot on organ lines, and a solid beat from the fellas. Recorded live, A Night In Copenhagen is well produced and mixed, and the sound quality is excellent. All this allows the music to stand on its own merits, and lets the audience be heard as well. The band is in fine form, and although the music has a vague 70s vibe about it, it sounds fresh and vibrant from the word go. Best of all, the club’s audience eats it up! A Night In Copenhagen is definitely worth a listen. Take it for a spin soon!